The InterLab’s goal is to identify and correct the sources of variability in measurements, to achieve this they created a way to reliably measure GFP expression in absolute fluorescence units. One of the problems with the InterLab’s current model is that the number of cells in the samples very. To solve this another goal was added: normalizing to absolute cell count or colony forming units instead of to the optical density (OD). A new experiment was introduced, in which the colony forming units (CFU) per 0.1 OD600 were calculated. We conducted the three calibrations, the cell measurement and the colony forming units per 0.1 OD600 E. coli culture experiments. For the cell measurement we transformed 8 plasmids into E. coli DH5-alpha. These 6 plasmids were provided by the iGEM HQ in the iGEM InterLab Kit. These test devices contained Anderson promoters and were inserted into a pSB1C3 backbone. A plasmid containing a promoter and GFP sequence (Bba_I20270) was used as the positive control and a plasmid containing a TetR repressible promoter (Bba_R0040) was used as the negative control. The plasmids were Test Device 1 (BBa_J364000), Test Device 2 (BBa_J364001), Test Device 3 (BBa_J364002), Test Device 4 (BBa_J364007), Test Device 5 (BBa_J364008) and Test Device 6 (BBa_J364009). Overnight cultures with these plasmids are diluted to an OD600of 0.02 and their absorbance (600 nm) and fluorescence (485/520) is measured in 96 well plates after 0 and 6 hrs of incubation. The fluorescein concentration is plotted against the measured fluorescence intensity of fluorescein. With this curve we converted the fluorescence of our cell measurements to a GFP concentration. To establish the CFU we counted colonies with the positive and negative control plasmids in differently diluted cultures. All measurements were conducted with a BMG lab tech CLARIOstar platereader using bottom optics. The bandpass filter was set at 530 nm/30 nm, the emission wavelength was in between 520 nm and 530 nm and the excitation wavelength was 485 nm. 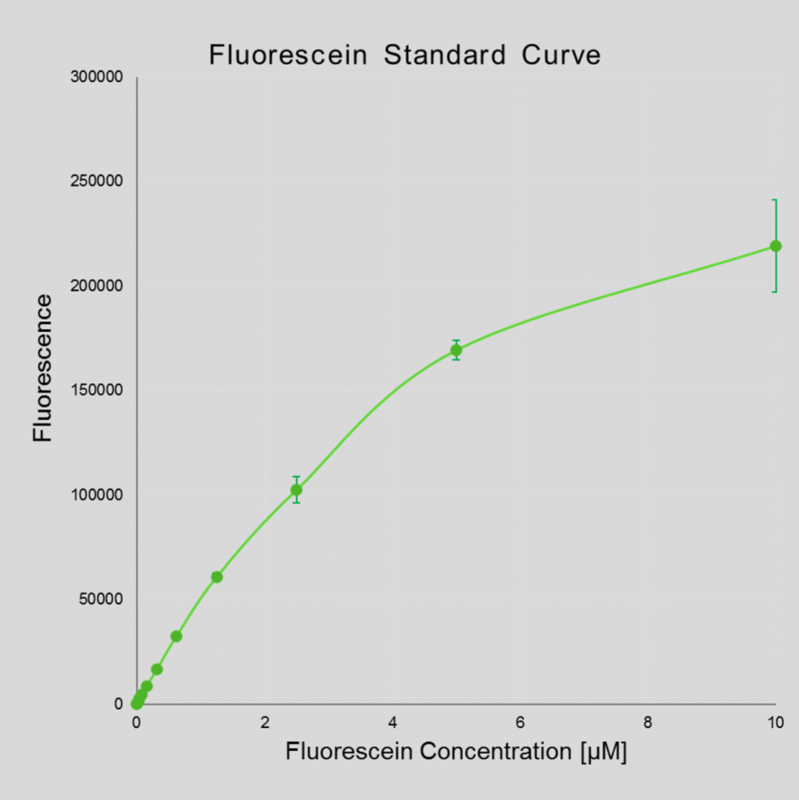 Figure 1: Fluorescein fluorescence calibration curve. The fluorescein concentration was plotted against its fluorescence intensity. A higher fluorescein concentration results in a higher fluorescence, but they are not linearly dependent. After a fluorescein concentration of about 5 µM the curve is saturated, and the fluorescence doesn’t increase as much anymore. Figure 2: Concentration GFP/OD600. 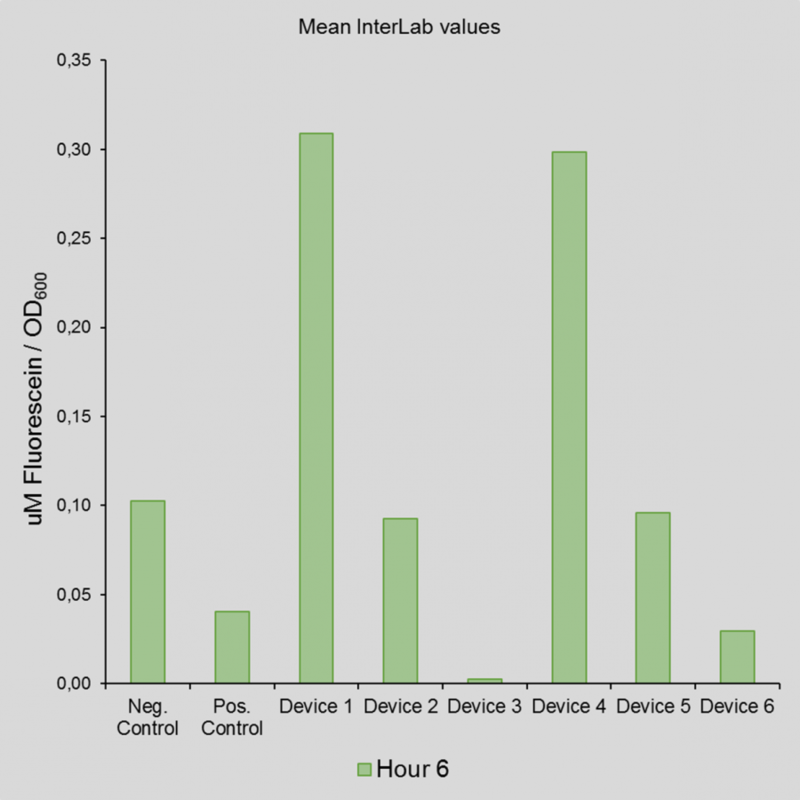 Bar chart presenting the concentration of GFP/O600 of test devices 1, 2, 3, 4, 5 and 6, positive and negative control after 6 hours of incubation. Device 1 showed the strongest fluorescence, followed by 4, 5, 2, 6 and 3. Table 1: List of devices used and their respective promotors. Device 1 showed the strongest fluorescence followed closely by 4. The devices 5 and 2 were a lot weaker then 1 and 4. Device s6 was even weaker and almost no signal was detected. We encountered some problems with test device 1. The OD600 didn’t change much in 6 hours of incubation, which suggest it didn’t grow much. All the samples were incubated together and the others all grew during this time. The negative control showed double the fluorescence as the positive control. This could have happened trough contamination or a pipetting error, where cells with a GFP expressing plasmids were inserted into the well. We used two iGEM protocols for these experiments, one for the general InterLab experiments and calibrations and another for transforming.